Army pistol-type construction, 2-1/4" wide. Replacement ratcheting-type headgear for "Fornery" 55666 (sku # 891.0069), 55673 (sku # 891.0077), 55697 ("Insta-Shade II") and old-style 55699 ("Insta-Shade III" - two control knobs on outside of helmet) welding helmets. Made of 600 poly ripstop fabric. Web loop for tape rolls. Cell phone pocket fits iPhone? 6. Made of 600 poly ripstop fabric. Holds small tools, pencils, flashlights and more. Size: 5 in. W x 2 in. D x 9 in. 1-3/4" Embossed top grain leather, steel single tongue buckle. Ideal for staying organized. It can hold utility knives, small flashlights and markers. It's made to last with heavy duty poly ripstop material. It features FlapFit?, a padded flap that easily attaches over a belt without removing it or in a pants pocket. Colorful and sporty looking 100% cotton cap that resists sparks. Bill assembled with multi-layers of cloth for flexibility. Multi-colored, reversible. Assorted colors available. Colorful and sporty looking 100% cotton cap that resists sparks. Bill assembled with multi-layers of cloth for flexibility. Multi-colored, reversible. Assorted colors available. 4 pockets and one padded pocket to fit most compact cell phones; attach to belt with snap closure or carry securely in pocket with wide padded flap; webbing slot for small flashlights or other tools; electrical tape sling and made of polyester fabric. Made of Poly Ripstop/600D poly material. This holster has 5 pockets to hold small hand tools. The adjustable belt can fit up to a 52 in. waist and has a quick release buckle and a tape clip built into it. There is also a heavy web hammer loop. Two main nail/tool pockets, smaller pockets fits pliers, nail sets and pencils. 2" polyweb belt with quick release buckle. Made of polyester fabric and ballistic nylon binding. 2 main nail and tool pockets, 3 small pockets for pliers, pencils, etc. 2" wide web belt. Made of Poly Rip Stop/600D poly material. Has 9 pockets and 8 tool loops. Flap fits inside pants pocket or over the belt. Has a clip for tape measure, tools and keys. Has web loop for tape rolls. Heavy duty suede leather. Large capacity nail/tool pocket. Fits belts up to 2-3/4" wide. Flap fit back fits inside pants pocket or over the belt. Made of Poly Ripstop/600D poly material. 4 inch notebook pocket, tape measure clips and 4 open bottom pockets for long tools. Belt is heavy duty suede leather with quick release buckle and steel hammer loop on a 2" polyweb belt. 5 main nail/tool pockets, 3 smaller pockets fit pliers, nail sets and pencils. Made of polyester fabric and ballistic nylon binding. Two main nail and tool pockets; 6 smaller pockets for pencils, nail sets, etc. Steel hammer holders. May be worn on left or right side. Fits belts up to 2-3/4" wide. Heavy duty suede leather. 2 Main nail/tool pockets; 6 Smaller pockets fit pliers, nail sets, pencils.. 2 steel hammer loops. Fits belts up to 2-3/4" wide. Steel double tongue roller buckle. Front cut down design for bending comfort. Made of top grain leather. Steel double tongue roller buckle. Front cut down design for bending comfort. Made of top grain leather. Four main nail/tool pockets, 6 smaller pockets fits pliers, nail sets and pencils. Steel hammer loops and metal clip holds all measuring tape sizes. Fits belts up to 2" wide. One main deep pocket, 2 front molded tool pockets, 2 tapered screwdriver holders. (1) Leather pocket fits up to 30' measuring tape. Tape chain and metal tool clip. Fits belts up to 2-3/4" wide. Includes ratcheting-type headgear, lift front 2" (50.8mm) x 4-1/4" (107.95mm) heat treated #10 shade lens and clear glass protective lens. Lightweight, tough and durable; UV/IR protection. Meets ANSI Z87.1 safety standards. "Forney" 55674 (sku # 891.0085) is replacement ratcheting-type headgear. Made of polyester fabric and ballistic nylon binding. 2 main pockets for tools/nail, 2 additional pockets and 6 small pockets for hand tools, pencils and nail sets. Pry bar or combination square holder. Heavy-duty double layer, lightweight fabric will not rot, crack, harden or mildew. Foam padding. 2" double tongue metal roller buckle. Grip strip fastening system hold pouches securely in place. Heavy-duty poly fabric construction provides strength and durability. The pouch has a main pocket with double pull zipper and small internal pockets provide multiple storage options. Small flap pocket with zipper to secure change, keys, or small phone, medium-sized pocket with hook and loop flap closure for added storage, clips onto pants or pockets or fits belt two inches wide. Made of polyester fabric and ballistic nylon binging. 4 main nail and tool pockets, 6 small pockets and center pocket holds tape or other tools. 2" wide web belt with steel buckle. Includes ratcheting-type headgear, 5-1/4" (133.35mm) x 4-1/2" (114.3mm) heat treated #10 shade lens and clear glass protective lens. Lightweight, tough and durable; UV/IR protection. Meets ANSI Z87.1 safety standards. "Forney" 55674 (sku # 891.0085) is replacement ratcheting-type headgear. Heavy-duty poly fabric construction includes reinforced edges for extra wear. The pouch has a large main pocket and smaller front pocket for convenient access to parts or tools. Web loops and sleeve pockets provide multiple storage options, handy flashlight or large tool sleeve, electrical tape strap plus carabineer for keys. Rear clip or attach to belt up to 2-3/4" wide. Four main nail/tool pockets, 6 smaller pockets fits pliers, nail sets and pencils. Leather holder fits up to 30' measuring tape, steel hammer loops. Leather combination square holder. 2" polyweb belt. Framer's nail and tool bag made of polyester fabric and ballistic nylon binding. 4 pockets for nails, tools, etc., 2" polyweb belt with quick release buckle, speed square holder, metal clip holds all measuring tape sizes, steel hammer loop. Made of polyester fabric and ballistic nylon binding. 4 main nail and tool pockets, 2 small pockets and 4 large screwdriver holders. Electrical tape strap, metal measuring tape clip and tool snap. Made of heavy duty 1680D 2-ply poly fabric. The large capacity interior pouch includes a pocket for a speed square. 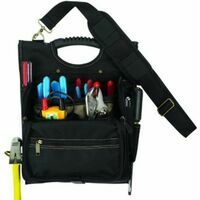 Includes a heavy duty web hammer loop and a couple of exterior tool loop holders. Fits on most work belts. Reversed heavy-duty leather. Two large capacity main nail/tool pockets; 6 Smaller pockets fit pencils, nail sets, pliers, etc. Fits belts up to 2 3/4" wide; 2 Steel hammer loops. Upper material: Suede leather. Primary color: Beige. Outside sole: Rubber. Construction: Goodyear Welt. Inside lining: Light and soft Cambrell fabric. Made of Poly rig Stop/600D Poly material. 2 large capacity pouches for holding medium and small hand tools. Has 11 pockets for holding tools, nails and other small parts. There is a small pouch that can hold a tape measure or use it to hold nails and other small parts. Heavy web hammer loop and steel buckle belt with monster grommets. Fits waists up to 52 in. Size: 21 in. W x 4.5 in. D x 10 in. H. Upper material: Action leather. Primary color: Black. Outside sole: Rubber. Construction: Goodyear Welt. Inside lining: Light and soft Cambrell fabric. Steel toe. Upper material: Action leather. Primary color: Black. Outside sole: Rubber. Construction: Goodyear Welt. Inside lining: Light and soft Cambrell fabric. Steel toe. Upper material: Action leather. Primary color: Black. Outside sole: Rubber. Construction: Goodyear Welt. Inside lining: Light and soft Cambrell fabric. Steel toe. Upper material: Action leather. Primary color: Black. Outside sole: Rubber. Construction: Goodyear Welt. Inside lining: Light and soft Cambrell fabric. Steel toe. Upper material: Action leather. Primary color: Black. Outside sole: Rubber. Construction: Goodyear Welt. Inside lining: Light and soft Cambrell fabric. Steel toe. Upper material: Action leather. Primary color: Black. Outside sole: Rubber. Construction: Goodyear Welt. Inside lining: Light and soft Cambrell fabric. Steel toe. Upper material: Action leather. Primary color: Black. Outside sole: Rubber. Construction: Goodyear Welt. Inside lining: Light and soft Cambrell fabric. Steel toe. Rugged, lightweight ballistic poly fabric. Stay-open features on main pockets with curved bottom make grasping nails, fasteners or parts a breeze. 3 main pockets for tools and nails and 6 smaller pockets for hand tools, pencils and nail sets. Steel hammer holder and metal clip positioned for quick access and easy tool return to keep your motion uninterrupted. Heavy-duty 1680d 2-ply poly material. Reinforced diamond PVC bottom holds bag upright. Includes 2 in. web belt with monster grommets and fits up to a 52 in. waist. Three-way carrying system, belt, handle or shoulder strap (shoulder strap not included). Tape measure clip, carabineer, t-chain tape roll holder. Goodyear welt construction stitched soles provide maximum strength and durability. Rubber outsole provides superior oil and slip resistance. Inside lining composed of light and soft fabric for added comfort. Meets ASTM F2413-05 Standards. Wide width allows for extra foot room. Contoured fiber footbed with steel shank insert for shock absorption and comfortable support. Padded leather tongue and collar for superior comfort. Steel toe for ultimate protection. Goodyear welt construction stitched soles provide maximum strength and durability. Rubber outsole provides superior oil and slip resistance. Inside lining composed of light and soft fabric for added comfort. Meets ASTM F2413-05 Standards. Wide width allows for extra foot room. Contoured fiber footbed with steel shank insert for shock absorption and comfortable support. Padded leather tongue and collar for superior comfort. Steel toe for ultimate protection. Goodyear welt construction stitched soles provide maximum strength and durability. Rubber outsole provides superior oil and slip resistance. Inside lining composed of light and soft fabric for added comfort. Meets ASTM F2413-05 Standards. Wide width allows for extra foot room. Contoured fiber footbed with steel shank insert for shock absorption and comfortable support. Padded leather tongue and collar for superior comfort. Steel toe for ultimate protection. Goodyear welt construction stitched soles provide maximum strength and durability. Rubber outsole provides superior oil and slip resistance. Inside lining composed of light and soft fabric for added comfort. Meets ASTM F2413-05 Standards. Wide width allows for extra foot room. Contoured fiber footbed with steel shank insert for shock absorption and comfortable support. Padded leather tongue and collar for superior comfort. Steel toe for ultimate protection. Goodyear welt construction stitched soles provide maximum strength and durability. Rubber outsole provides superior oil and slip resistance. Inside lining composed of light and soft fabric for added comfort. Meets ASTM F2413-05 Standards. Wide width allows for extra foot room. Contoured fiber footbed with steel shank insert for shock absorption and comfortable support. Padded leather tongue and collar for superior comfort. Steel toe for ultimate protection. Made of polyester fabric and ballistic nylon binging. 6 main nail and tool pockets and 10 small pockets. Padded comfort belt with double adjustment. Cordura? Ballistic fabric. Barrel-bottom, super capacity pouch. Single body construction. Double layer pouch bottom. Speed square pocket. Heavy-duty web hammer loop. 3 vertical tool pockets. Pouch handle allows for simple belt adjustments and easy 1 hand carrying. Large, gusset style pockets provide extra capacity and easy access, 3" padded, air mesh fabric belt helps reduce heat and moisture accumulation. Built in utility knife pocket helps prevent accidental pouch punctures, 7 main pockets with 9 smaller pockets and sleeves for nails, parts, tools, nail sets and pencils. Double layer of rugged, lightweight ballistic poly fabric; easy carry handle design provides simple adjustments, easy carrying and storage of apron without spilling contents; gussets keep front pockets wide open for greater access; bottoms of main pockets are reinforced for better resistance to abrasion; exclusive metal hook to carry cordless drill, nail gun or other power tools; built-in utility knife pocket helps prevent accidental pouch punctures; 3" wide padded comfort belt with double tongue steel roller buckle. Made of polyester fabric and ballistic nylon binging. Completely adjustable, padded suspenders engineered to hold and distribute weight comfortably. 3" wide padded comfort belt with steel roller buckle. Carry handle design provides for adjustments and storage without spilling contents. Fits waist sizes 29"-46". Integrated back support and work suspenders. 24 total pockets for nail and tool storage. Heavy duty fabric for maximum durability. Moisture-wicking mesh liner; 3 boxed front nail pouches and rafter square pocket. Work Suspenders feature Custom molded,'Dead On' heavy duty logo clip; clips to tool belt or pants; 2" webbing and elastic straps and cell phone holster. Made of heavy-duty leather. 4 main reversed nail/tool pockets, 6 smaller pockets fit pliers, nail sets, and pencils. (1) center pocket fits up to 30' measuring tape, and (1) combination square pocket. Metal snap-in hammer loop, 2" heavy-duty leather belt. Rivets, buckle and loops with antique brass finish. Does not include tools. 2 inch wide web belt with double-tongue roller buckle helps keep belt stable. 5 main pockets with 7 smaller pockets and sleeves for nails, parts, tools, nail sets, pencils, etc. Patented pouch handle allows for simple belt adjustments and easy one-hand carrying. Swinging "Snap-In" hammer holder makes it easy to secure your hammer. Double-gusset front pockets provide extra capacity and easy access. Heavy-duty leather. Rrugged, lightweight ballistic poly fabric; easy carry handle design provides simple adjustments, easy carrying and storage of apron without spilling contents; gussets keep front pockets wide open for greater access; bottoms of main pockets are reinforced with PVC material for better resistance to abrasion; built-in utility knife pocket helps prevent accidental pouch punctures; prybar or combination square holders; 5" wide padded comfort belt with double tongue steel roller buckle. Ideal helmets for hobbyists and beginner welders; SHELL AND HEADGEAR FEATURES: Lightweight (less than 1 lb. ), impact resistant, fireproof shell; quick-fit, 5-point adjustable geared headband with sweatband mechanism greatly reudces head/neck strain and general fatigue caused by repeated lowering of the helmet during day-to-day welding operations. AUTO-DARKENING FILTER (ADF) FEATURES: - 5.97 sq. in. (3.62" x 1.65") viewing area; DIN 9 to 13 variable shade selection (TIG operable to 15 amps); two optical arc sensors help protect against the hazards of arc flash; 1/1/1/2 optical clarity rating; UV/IR coating to reduce scratching and discoloration of the lens; 1/16,000 per second switching speed; cheater/magnifying lens compatible design. ADDITIONAL FEATURES: - external shade selector knob with grind option allows for quick shade modifications. Internal switch controls include both sensitivity (high-low) and delay (min.-max.) adjustments. Solar cells with non-replaceable 3V lithium batteries and automatic on/off technology. Meets all related CE standards (DIN and ISO), EN166, EN175, EN379, ANSI Z87.1, CSA Z94.3, AS/NZS1337 and AS/NZS1338 safety standards. Made of 1680 heavy-duty poly fabric. HV retro-reflective meets EN1150 worldwide standard. Infinity belt fits up to a 52 in. waist. Barrel-bottom, super capacity pouches. Reinforced pouch bottoms. Padded back support belt. Adjustable pouch system. Speed square pocket. Dual hammer loops. Steel buckle and monster grommets. Unique, padded suspenders engineered to carry loads comfortably and distribute weight evenly without strain on lower back and hips. Easy carry handle design provides for simple adjustments and easy storage without spilling contents. New and improved pockets with more capacity and easy access to contents. Metal hook to carry cordless drill, nail guns or other power tools. 5" Wide padded comfort belt with double tongue steel roller buckle. Bottoms of main pockets are reinforced with PVC material for better resistance to abrasion. Double layer or rugged, lightweight ballistic poly fabric with easy carry handle design provides for simple adjustments, easy carrying and storage of apron with spilling contents. Gussets keep front pockets wide open for greater access and bottoms of main pockets are reinforced with PVC material for better resistance to abrasion. Built-in utility knife pocket helps prevent accidental pouch punctures. 5" wide padded comfort belt with double tongue steel roller buckle. Fits waist sizes 29"-46". Double layer or rugged, lightweight ballistic poly fabric; adjustable and padded suspenders to hold and distribute weight comfortably; main pockets reinforced on bottom with PVC material for better resistance; 5" wide padded comfort belt with steel roller bucket. Ideal helmets for hobbyists and beginner welders; SHELL AND HEADGEAR FEATURES: Lightweight (less than 1 lb. ), impact resistant, fireproof shell; quick-fit, 5-point adjustable geared headband with sweatband mechanism greatly reudces head/neck strain and general fatigue caused by repeated lowering of the helmet during day-to-day welding operations. AUTO-DARKENING FILTER (ADF) FEATURES: - 5.97 sq. in. (3.62" x 1.65") viewing area; DIN 9 to 13 variable shade selection (TIG operable to 15 amps); two optical arc sensors help protect against the hazards of arc flash; 1/1/1/2 optical clarity rating; UV/IR coating to reduce scratching and discoloration of the lens; 1/16,000 per second switching speed; cheater/magnifying lens compatible design. ADDITIONAL FEATURES: - external shade selector knob with grind option allows for quick shade modifications. Internal switch controls include both sensitivity (high-low) and delay (min.-max.) adjustments. Solar cells with non-replaceable 3V lithium batteries and automatic on/off technology. Meets all related CE standards (DIN and ISO), EN166, EN175, EN379, ANSI Z87.1, CSA Z94.3, AS/NZS1337 and AS/NZS1338 safety standards. Ideal helmets for hobbyists and beginner welders; SHELL AND HEADGEAR FEATURES: Lightweight (less than 1 lb. ), impact resistant, fireproof shell; quick-fit, 5-point adjustable geared headband with sweatband mechanism greatly reudces head/neck strain and general fatigue caused by repeated lowering of the helmet during day-to-day welding operations. AUTO-DARKENING FILTER (ADF) FEATURES: - 5.97 sq. in. (3.62" x 1.65") viewing area; DIN 9 to 13 variable shade selection (TIG operable to 15 amps); two optical arc sensors help protect against the hazards of arc flash; 1/1/1/2 optical clarity rating; UV/IR coating to reduce scratching and discoloration of the lens; 1/16,000 per second switching speed; cheater/magnifying lens compatible design. ADDITIONAL FEATURES: - external shade selector knob with grind option allows for quick shade modifications. Internal switch controls include both sensitivity (high-low) and delay (min.-max.) adjustments. Solar cells with non-replaceable 3V lithium batteries and automatic on/off technology. Meets all related CE standards (DIN and ISO), EN166, EN175, EN379, ANSI Z87.1, CSA Z94.3, AS/NZS1337 and AS/NZS1338 safety standards. Heavy-duty 1680d poly material; LoadBear stretch suspension for comfort; speed square pocket; adjustable velcro pouches; steel buckle belt with monster grommets; fits waists up to 52". Made of 1680 denier heavy-weight poly fabric. LoadBear? stretch suspension. Infinity belt fits up to 52 in. waist. Single body construction (no joints to fail). Barrel bottom pouches for extra capacity. Heavy-duty 1680d poly material; LoadBear stretch suspension for comfort; speed square pocket; adjustable velcro pouches; steel buckle belt with monster grommets; fits waists up to 52". Made of 1680 heavy-duty poly fabric. LoadBear? stretch suspension for comfort. Infinity belt fits up to a 52 in. waist. Barrel-bottom, super capacity pouches. Reinforced pouch bottoms. Adjustable pouch and rigging system. Speed square pocket. Dual hammer loops. Steel buckle and monster grommets. Cell phone pocket fits up to an iPhone? 6. Adjustable chest strap buckle. Made of 1680 heavy-duty poly fabric. LoadBear? stretch suspension for comfort. Infinity belt fits up to a 52 in. waist. Barrel-bottom, super capacity pouches. Reinforced pouch bottoms. Adjustable pouch and rigging system. Speed square pocket. Dual hammer loops. Steel buckle and monster grommets. Cell phone pocket fits up to an iPhone? 6. Adjustable chest strap buckle. Ideal helmets for intermediate or advance welders; SHELL AND HEADGEAR FEATURES: Lightweight (approximately 1 lb. ), high impact resistant nylon shell, quick-fit, 5-point adjustable geared headband with sweatband mechanism greatly reudces head/neck strain and general fatigue caused by repeated lowering of the helmet during day-to-day welding operations. AUTO-DARKENING FILTER (ADF) FEATURES: - 7.70 sq. in. (3.93" x 1.96") viewing area; DIN 9 to 13 variable shade selection (TIG operable to 8 amps); four optical arc sensors optimize arc detection and reduce the risk of blocked sensors during out-of-position welding detection; 1/1/1/2 optical clarity rating; UV/IR coating to reduce scratching and discoloration of the lens; 1/16,000 per second switching speed; cheater/magnifying lens compatible design. ADDITIONAL FEATURES: - external shade selector knob with grind option allows for quick shade modifications. Internal switch controls include both sensitivity (high-low) and delay (min.-max.) adjustments. Solar cells with 2-each replaceable 3V lithium batteries and automatic on/off technology. Meets all related CE standards (DIN and ISO), EN166, EN175, EN379, ANSI Z87.1, CSA Z94.3, AS/NZS1337 and AS/NZS1338 safety standards. Heavy-duty 1680d 2-Ply poly material; LoadBear stretch suspension for comfort; large capacity pouches; speed square pocket; adjustable velcro pouches; steel buckle belt with monster grommets; fits waists up to 52". Crafted from super tough, ballistic poly and top grain leather. Easy carry handle design provides simple adjustments, easy carrying and storage of combo without spilling contents. 8 main reversed nail/tool pockets, 17 smaller pockets fit pliers, nail sets, pencils, knife, etc, Leather combination square and pry bar holders. 5" wide padded comfort belt with double tongue steel roller buckle. Easy carry handle design provides simple adjustments, carrying and storage of combo without spilling contents. 5 main reversed nail/tool pockets. 10 smaller pockets fit pliers, nail sets, pencils, knife, etc. Leather holder fits up to 30' measuring tape. Leather combination square and pry bar holders. 2-3/4" wide heavy leather belt with double tongue steel roller buckle. Extra-strength rivets with washers at key stress points. Fits waist sizes 29"-46" Made of super heavy-duty ballistic nylon; "LoadBear" stretch suspension; infinity belt fits up to 52"; single body construction (no joints to fail); barrel bottom pouches for extra capacity. The optimal helmets for professional welders; SHELL AND HEADGEAR FEATURES: Lightweight (approximately 1 lb. ), high impact resistant nylon shell, quick-fit, 5-point adjustable geared headband with sweatband mechanism greatly reudces head/neck strain and general fatigue caused by repeated lowering of the helmet during day-to-day welding operations. AUTO-DARKENING FILTER (ADF) FEATURES: - 9.144 sq. in. (3.81" x 2.4") large viewing area; advanced optical technology provides ultra-high viewing definition of arc and puddle; DIN 5 to 8 cutting, low current welding; adjustable shades 5 to 9 for TIG process low intensity, oxyacetylene welding - 9 to 13 variable shade selection (TIG operable to 5 amps); four optical arc sensors optimize arc detection and reduce the risk of blocked sensors during out-of-position welding detection; 1/1/1/1 optical clarity rating; UV/IR coating to reduce scratching and discoloration of the lens; 1/20,000 per second switching speed; cheater/magnifying lens compatible design. ADDITIONAL FEATURES: - internal shade selector with grind option improves chances of accidental setting changes. Internal step-less controls include both sensitivity (high-low) and delay (min.-max.) adjustments. Solar cells with 2-each replaceable 3V lithium batteries and automatic on/off technology. Meets all related CE standards (DIN and ISO), EN166, EN175, EN379, ANSI Z87.1, CSA Z94.3, AS/NZS1337 and AS/NZS1338 safety standards.